Déménagement en provenance/direction de Peoria IL 61604? 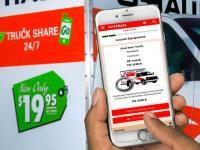 Obtenez GRATUITEMENT des estimations de tarif pour la location de camion au U-Haul Moving & Storage at University. Les camions de location U-Haul sont spécifiquement conçus pour déménager des familles et non pour transporter des marchandises. Nos camions de déménagement possèdent plus de particularités de sécurité que tous les autres camions de déménagement de l'industrie, incluant une suspension pour un roulement en douceur et des rétroviseurs offrant une grande visibilité afin d'aider le conducteur. Que vous déménagiez d'un petit appartement ou d'une grande maison, le service de location de camions U-Haul à Peoria, IL vous offrira la location de camion de déménagement dont vous avez besoin pour vous rendre du point A au point B. Trouvez le camion de déménagement de la taille parfaite pour vous aider à déménager chez U-Haul, qui offre la location de camion à 19,95 $! Cliquez sur chacun des camions de déménagement ci-dessous pour connaître les caractéristiques techniques de chacun d'eux, comme les particularités de sécurité, la capacité de remorquage, la consommation de carburant et bien sûr, l'espace disponible selon les dimensions du camion. Chaque camion de location est offert à un prix unique pour vous aider à économiser de l’argent, du temps et de l’énergie pour votre déménagement à destination ou au départ de Peoria, IL. Les fourgonnettes et camionnettes de location U-Haul de Peoria, IL sont idéales pour les projets d'amélioration domiciliaire, les livraisons et d'autres petits chargements. Louez une fourgonnette ou une camionnette pour économiser lors d'un déménagement ou de livraisons de courte distance. La location de fourgonnettes et de camionnettes est très populaire auprès des entreprises locales et des étudiants, comme pour les petits déménagements résidentiels à Peoria IL 61604. Nos fourgonnettes de déménagement en location sont équipées de la climatisation, de barres de protection pour protéger vos biens et d'une attache pour remorque de location. U-Haul offre des fourgonnettes de location à 19,95 $ à Peoria, IL; réservez une fourgonnette pour votre déménagement chez U-Haul Moving & Storage at University! Anthony and Anthony were extremely pleasant and helpful in my move. They got me situated and it went perfectly. However, upon returning my Uhaul at 4:30 Friday afternoon, the attendant (larger, young, African-American man with glasses) was very rude. I wasn’t sure of the process and instead of talking me through it, he sharp-wittedly and snarkily directed me to next steps. It was a very unpleasant end to an otherwise great experience. This facility is always busy, but the service provided is excellent. Every customer is treated with care and attention. The employees go above and beyond to provide quality service. I would recommend this location to everyone. That uhaul location is always great I've used it for over 40 years!!! Poor service. Very rude to every customer. It’s like the blind leading the blind inside and outside of the store . And my money still hasn’t been put back on my card yet . Not pleased at all . The service is quite slow at this location. 1 hour time wait time even if I booked online earlier. When I took the rental, I was told Tank is 3/4th Full. Later when I came to the truck I found it was lesser. But, did not go back to store and report as I did not have time to stand again in queue waiting for another hour.I drove only 9 miles but had to fill 6 gallon of Gas. Bit dissappointed due to above 2 facts. The inside windshield looked like it had been sprayed with water or other cleaner and just allowed to dry instead of being wiped down, causing lots of spotting which made it very difficult to see thru when driving into the sun. I was in a bind. My granddaughters car had a serious engine problem while on a trip back from Omaha to Michigan. They had to stay in a motel that night, The next day, went to Illinois to get them. We went to the repair shop and were told that the engine needed to be replaced. I found the U-Haul store in another town and went there on a Sunday. The guys at the store jumped right on it and installed a hitch on my vehicle and went to another store to get me an auto transport trailer. They had me on my way back home in about three hours total. I felt they went above and beyond for me and my family and am very grateful to them. Outstanding job. I had trouble starting the truck 3 times...it would Not start. I had the same problem back in Sept. or Oct. when I moved last year. Good. Fast. Efficient. What they lack in personality they more than make up for in efficiency. It's like going to Gringotts. Great customer service, It was first class. Thanks to the employee who remember me from last rental. seemed understaffed. people there working hard just not enough of them. Very pleased and great service from the staff. I will use again in the future. Get Anthony some quality help. To often there is a line. The gentlemen helping me check in was very professional and efficient.